SSA Marine, formerly Stevedoring Services of America, was founded in 1949 and is today one the largest marine operators in the world. When they changed the name in 2003, the created a new company, Carrix, Inc., which is currently the parent company of SSA. They are a $1 billion a year, family owned company with over 10,000 employees and a long history of anti-labor union activity. SSA Marine developed a subsidiary Pacific International Terminals to develop the Gateway Pacific Terminal in 2011. 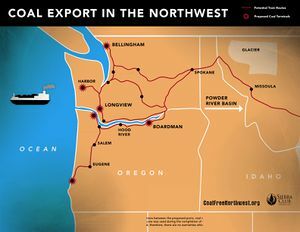 In October 2011 concerned environmental groups in the Spokane, Washington area held a public forum about coal trains in that are to travel through the area. The groups began speaking out about proposals that could see dozens of trains loaded with coal destined for Asia move through the city every day. The groups fear that coal dust and increased diesel emissions will damage human health, while increased rail traffic will make for more dangerous intersections. ↑ 6.0 6.1 6.2 John Stark, "Gateway Pacific terminal at Cherry Point starts permit process" The Seattle Times, March 1, 2011. This page was last edited on 26 June 2014, at 20:42.